The City of Los Angeles’ Department of Water and Power (LADWP) serves more than four million residents with water and electricity. The largest municipal water and power utility in the U.S., the LADWP utility services roughly 680,000 water meters. Faced with the challenges of aging infrastructure and limited budgets, LADWP sought to improve management of incidents such as leaks, outages, or quality issues in delivering water to its customers. For years, LADWP utilized multiple systems for water incident management customized into their legacy Customer Information System (CIS). One system handled incidents such as outages, pressure variations, or leaks, while a second system tracked issues related to water quality. A third system managed daily planned maintenance and repair activities being performed by LADWP field crews. To replace these functions as the CIS was being replaced, and to streamline its operations, LADWP wanted to find a commercial, off-the-shelf system that would bring incident management for water service to the same level of performance provided to its electricity customers. In 2013, LADWP implemented the Trimble eRespond® Incident Management solution to merge the three previously separate systems and improve overall incident management and customer relations. 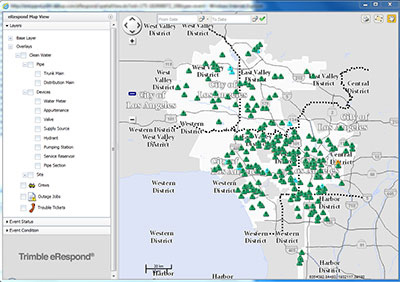 LADWP selected Trimble eRespond in part because it was a proven solution for water and wastewater utilities of similar size; it also gave them the ability to leverage LADWP’s existing Esri GIS and tie to their new Oracle Customer Care and Billing (CC&B) solution for customer information and billing. In addition, the Trimble system met LADWP’s requirement to use a commercial off-the-shelf product. In addition to using customer calls for incident management, LADWP now has the ability to use Trimble eRespond to blend telemetry data from system pumps and facilities in the future. This information often provides important input into the effort to locate and resolve a leak, pressure concern, or water quality incident. Over time, improved asset management will help LADWP achieve longer asset life and improve overall system operations. During an incident, crews can use the GIS to map the severity and extents of any spills to assist in notification, repairs, and mitigation work. The spatial data also help to fulfill requirements for reporting water or wastewater incidents to regulatory agencies. In concert with IBM, as the system integrator and SAP implementation partner, Trimble eRespond was integrated with the SAP CRM, SAP ECC, and SAP BI modules using standard interfaces. The interfaces used a combination of integration technology, including SOAP-based web services, Trimble eRespond’s standard JMS adapter, and direct database connections. United Utilities decided to create a complete model of their networks in eRespond using the tools within eRespond available for designing and managing a network model. Some utilities link eRespond to whichever system is master of their “as designed” network model data for this information. The initial network model was created inside a period of four weeks.